My heart has felt so heavy. It seems that there’s so much suffering and darkness in our world and in the media. My heart takes this energy on and begins to feel heavy and grave. Though I feel compassion, I know bad news is not meant to bring me down. 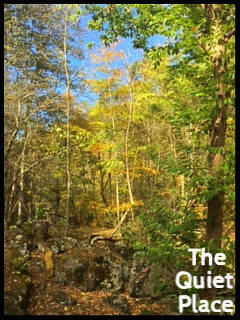 Last week I was able to go to one of my favorite places in the world, The Quiet Place– a little non-profit retreat located in the North Carolina mountains (Above is a photo of the fall foliage from my cabin. Wanna see the foliage yourself? They still have room available! 828-688-2689). In my cabin beside a rushing waterfall, I was able to reconnect with Nature and a sense of Peace. While there I began to read “The Book of JOY” by the Dalai Lama and Desmond Tutu. What stood out to me in the book is the concept that inner joy is not contingent to any given situation. As long as one is focused on the Self and keeps one’s attention on how good or bad the Self is doing, the person will always suffer. Bringing our attention to our connection with others dissolves separation and encourages a sense of unity. Our sense of separation causes suffering. Daily 10 minute meditation on compassion and kindness for others can make you happier! Neuroscientist Richard Davidson has discovered 4 brain circuits that affect the “Happy Brain”. Rachel offers several trainings each year. Many trainings are online so you can take them from anywhere! Deepen your spiritual journey and connect with your intuition! Learn more about Intuitive Trainings .